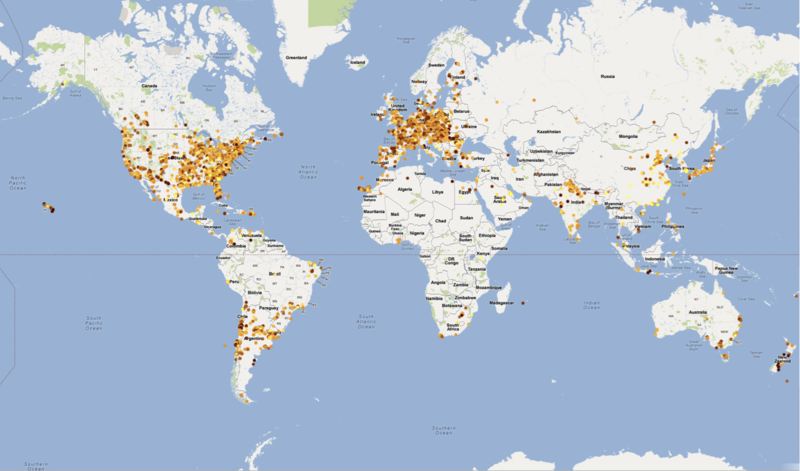 The total number of observations during the 2012 GLOBE at Night campaign was 16,850. The 2nd largest number of countries (92) participated in this year’s event; 20 of those countries contributed about 95% of all observations. The top 20 countries were United States (6072), India (2472), Poland (1196), Argentina (879), Germany (859), South Korea (828), China (628), Chile (488), Croatia (374), Romania (324), Spain (278), Canada (254), Mexico (217), France (206), Czech Republic (173), Hungary (142), South Africa (130), Uruguay (122), Macedonia (115) and Slovakia (98). The United States (with 47 states plus the District of Columbia) contributed 40% of all the observations. 18% of those were from the state of Arizona (1116 measurements). The next three states with the most observations were South Carolina (677), Texas (420) and Oklahoma (357). For full access to the GLOBE at Night database, data files in various formats from any of the 7 years are downloadable from the map page. Additionally, clicking any map on that page will open a second window with an interactive world map on which you can display data from any year, limiting magnitude, and topological appearance. And you can zoom in to within a few kilometers resolution. Globe at Night is a program of the National Optical Astronomy Observatory, the national center for ground-based nighttime astronomy in the United States, operated by the Association of Universities for Research in Astronomy (AURA), under cooperative agreement with the National Science Foundation.